At the junction of eight intersecting walkways Guillermo, or William, Brown could not find a more prominent spot to rest in peace. Born in Ireland in 1777, his family fled to the US to escape religious persecution. Brown became a merchant marine & earned the title of captain at the young age of 19. 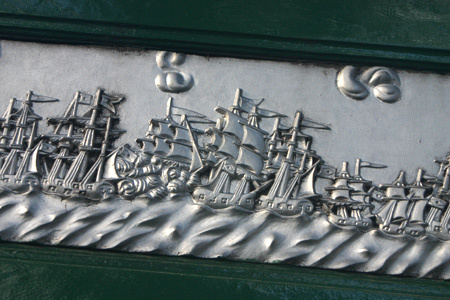 In an odd twist of fate, he was captured by the British at sea & later joined the Royal Navy. England was turning out naval greats like Horatio Nelson at the end of the 18th century, so Brown was in the right place at the right time. Brown also met his wife while in England, & their household became a model of tolerance at the time mixing Irish Catholic & British Protestant members. Soon after their marriage, the Browns arrived in Argentina. 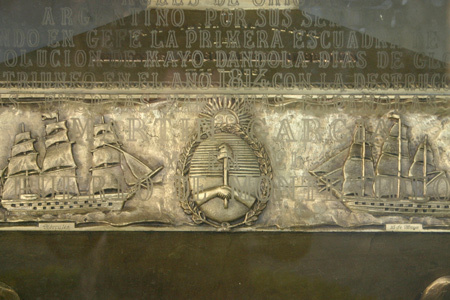 He ran trade between Montevideo & Buenos Aires, acquiring enough money to buy his own boat & a large mansion. 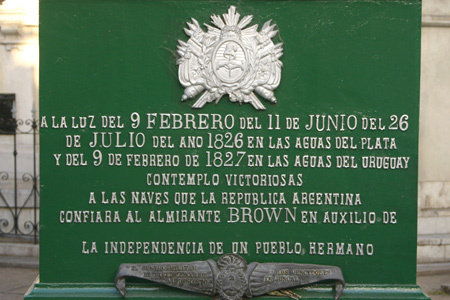 After independence, Brown offered his services to the new nation & helped found the Argentine Navy. Over the next 35 years he served Argentina well by winning battles against Brazil & impeding the British-French naval blockade. Brown died in 1857 in Buenos Aires at the ripe old age of 80. 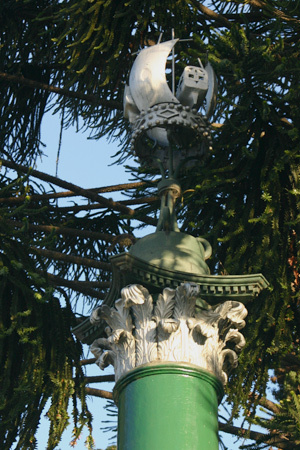 His final rites were performed by fellow Irishman Father Fahy, whose cenotaph can be found directly across from Brown. 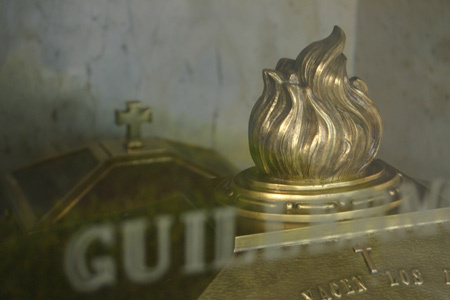 Brown’s wife could not be buried alongside him because non-Catholic burials were not allowed in Recoleta Cemetery at that time. 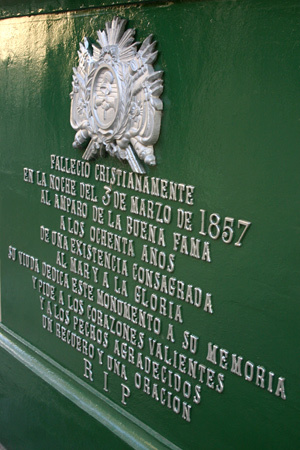 She was laid to rest in the Cementerio de Victoria, now Plaza 1º de Mayo, used by both Protestant & Jewish residents. Very interesting article about Admiral William Brown. 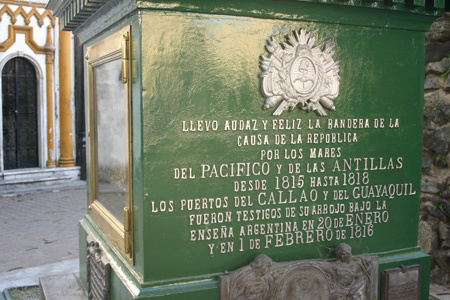 Hope I get to visit Buenos Aires some day and see the monument and this graveyard. Being an ex-patriate Irishman it is always interesting to read about the exploits of Irishmen who went out into the world and made their mark in history. Tim – Thanks for stopping by… I’ve been a big fan of your blog for some time. 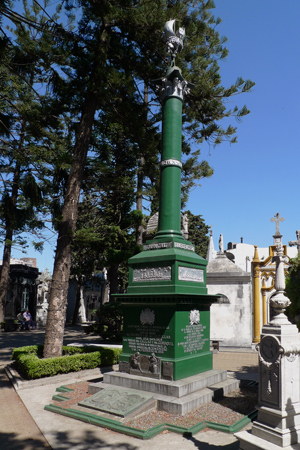 There’s a large Irish influence in Argentina, & a lot of the early tombstones left in Recoleta Cemetery are from the Irish. Hope you make it to BA one day! Ireland honoured him in 1957 by issuing a postage stamp with his image. More recently a monument was unveiled to him in Foxford Co Mayo the place where he was born in 1777. He visited Foxford in 1847 when the Great Hunger had killed thousands of Irish people through startvation and disease and was forcing thousands of others to emigrate to US to survive and make a new life. He must have been appalled by what he saw in the West of Ireland then. Thanks very much for the comment, Máire!! Great to hear from someone from Ireland. I did not know that he returned to Foxford… I thought he remained in Argentina all those years. His adopted country was not doing so well in the 1840’s either but definitely better than the West of Ireland at the same time. I’ll take a look on the internet for a photo of the monument. Thanks again & saludos desde Argentina!